Our First Home’s Roughan family will pocket a profit of $22,432 after their home was sold at tonight’s live auction for $800,000. Originally from Gore and Wellington, Lyn and Pat Roughan, their daughter Steph and her boyfriend Sam have spent the past 9 weeks turning the tired and dated three bedroom house they purchased in Te Atatu South, Auckland into a stunning four bedroom home. The family who makes the biggest percentage gain at auction will take home the additional $100,000 prize for their kid’s first house deposit. Adding 2.88% of value to their property, the Roughans have not done enough to knock the Wotton family out of top position. The sale of the Wotton's Henderson house saw them achieve a value increase of 14.59% after their house sold for $780,000 with a profit of $99,284 in Sunday’s first live auction. TVNZ Head of Content, Jeff Latch, says the auction was tense but is happy the family’s commitment to the show has paid off. "The Roughan family have been an integral part of Our First Home, and we’re glad that tonight’s auction has been a successful one for them. Tomorrow night is sure to be a nail-biter as we find out who will also take home the grand prize." The Roughan family are still pleased with the result and thankful the experience will help Steph and Sam to take their first step on the property ladder. "We are really proud of what we achieved as a family and hope the new owners love the home as much as we do" says Steph Roughan. Tomorrow night (Tuesday 19 April), we return to Henderson where the Pearce whanau will go to auction. It’s a night not to miss, as the Our First Home families learn who gets to take home the grand prize of $100,000. 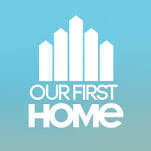 Our First Home’s Live Auction Week continues on Tuesday at 7.30pm on TV ONE.